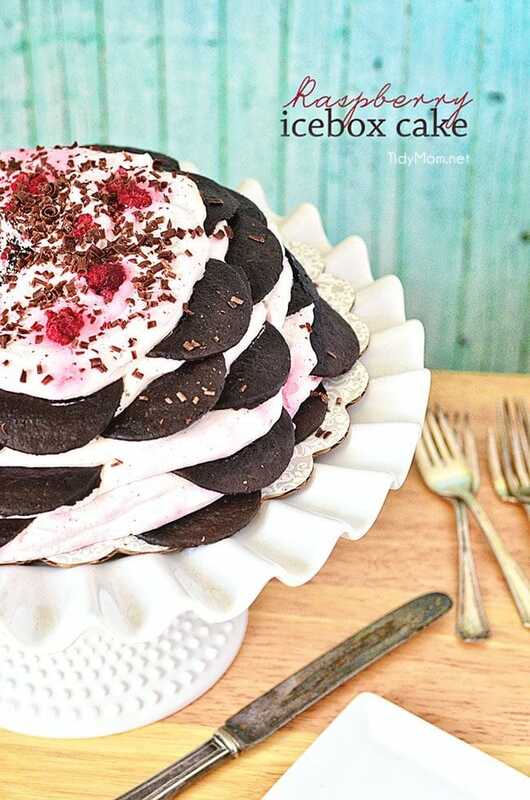 Raspberry Icebox cake is an easy, no-bake dessert with layer after layer of chocolate wafers and raspberry whipped cream. Last week was my birthday. I have been wanting to make an icebox cake ever since I had a slice at Magnolia’s Bakery when I was in Chicago and again in New York last year. I feel in love with this decadent layered dessert, then Kristen told me how easy they are to make! You might remember two years ago, I learned how to decorate a birthday cake with buttercream for my own birthday, and I made a layered Thin Mint birthday cake for my mom’s that same year. Last year I made the ever impressive Rose Cake for my Aunt’s birthday. So for my birthday this year I decided to make a birthday cake that is easy, stunning and delicious… a Raspberry Icebox Cake! There’s no need to find Magnolia’s or even wait for a birthday to make this cake. It’s so simple, requires virtually no skill and no oven! With just a few simple ingredients, it’s the easiest no-bake cake of all time! The perfect Birthday Cake, in my opinion! An icebox cake is simply cookies layered with whipped cream or custard. After sitting in the fridge over night, the cookies absorb the moisture from the filling and transform into a cold, creamy delight. Allowing you to cut it into the perfect slice of the easiest, most amazing dessert you’ve ever eaten. The variations with this cake are endless! Check out how Maria made Chocolate Icebox Cupcakes for her son’s first birthday! For my cake, I simply added some frozen raspberries (thawed) to this nostalgic recipe from Magnolia Bakery Cookbook. Do note, that the Nabisco Chocolate Wafer cookies can be a bit elusive. So you might need to call around and find out who carries them where you live. Here in St. Louis, I found them at Schnucks, I didn’t check Dierbergs, but I bet they have them too. In a large bowl, whip the heavy whipping cream with the sugar & vanilla extract on a medium high speed until the cream thickens slightly in the middle. Once the cream begins to thicken, whip on high speed for 30 seconds to 1 minute until soft peaks form. Do not over beat. Using a least a 9" flat plate or cardboard cake round, and an offset spatula, begin by putting a very thin layer of whip cream on the plate, spinning and smoothing the cream out to the inner edge of the plate. This will help keep the first layer of wafers in place. Arrange seven wafers, side by side in a circle, keeping 1 cookie in the center. Scoop about 1/2 - 3/4 cup of whipped cream onto wafers and gently spread the cream in a thin layer until you can barely see the edge of the wafers. Continue to layer the wafers with the cream, making sure to end with the whipped cream layer on the top ( you should end with about 7-10 layers). Garnish with raspberries and chocolate shavings. Cover and refrigerate for at least 5 hours or overnight before cutting & serving. This cake makes a spectacular centerpiece for any occasion……..like a birthday or even if you are just celebrating Friday!! 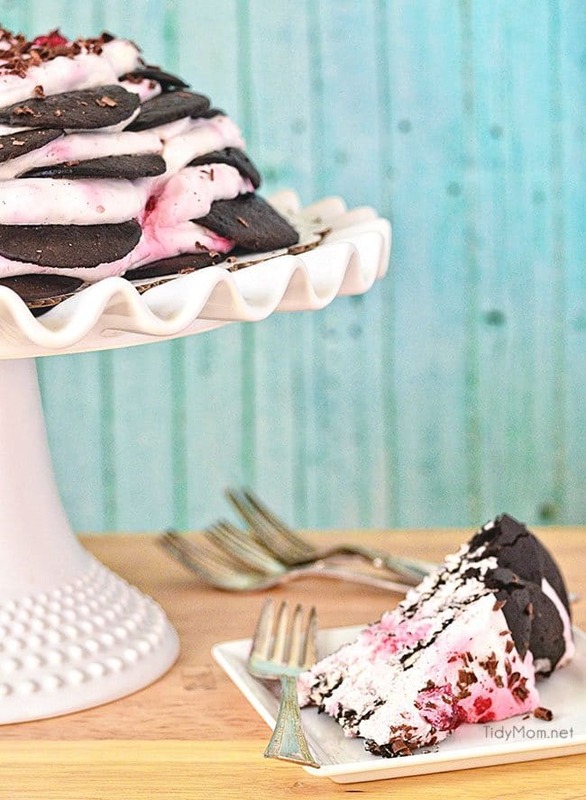 Like this Raspberry Icebox Cake Recipe? Pin It! Have you ever had icebox cake? if so, what flavor? Oh, YUMMY! I always wondered how that worked – not that you’ve explained it (so beautifully!) I think I’ll give it a try! Love this cake! We are huge icebox fans! Thanks for the link love! The cupcakes are perfect for the kiddos! Such a beautiful cake! Thanks for hosting such a fun link party! Oh, I love those cakes!! Yours looks beautiful. Hope you had a wonderful birthday! i’ve never had an ice box cake! this looks amazing!!! thanks for the party! Oh. My. Goodness. That cake looks amazing!! It’s fun to look at and I bet it is soooo good. Really chocolate and raspberries…my favorite combo…you just can’t go wrong. On my way to ‘pin’ it now, Cheryl!! The cake looks beautiful (especially on that cakes stand) and it looks scrumptious as well! Thank you for hosting, Cheryl! Well doesn’t that look yummy. Thanks for the recipe Cheryl! Oh my GOSH, Cheryl! That cake looks gorgeous…and scrumptious!!! I’m drooling all over your cake… sorry about that! YUM! Thanks for the party, but I HATE being late. The Twitter chat was fun, but so difficult to keep up… Have a great weekend! Thanks so much for hosting, Cheryl, and HAPPY BIRTHDAY! Mmm this looks so tasty!! 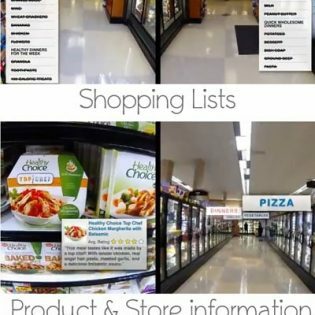 That looks amazing and so easy! Thanks for hosting. Thanks for hosting, Cheryl! Happy St. Patrick’s Day! Easy and SO PRETTY! Gotta love that! I’ve never had an icebox cake (that I can remember). But that one looks incredible! You think of Everything Cheryl! Wow that is so impressive looking, I bet it tastes great! I love icebox cakes! I’ve been making them since I was a little girl and my grandchildren enjoy making them with me, too. This is a really lovely one. Chocolate and raspberry is just an unbeatable combination, isn’t it? Thank you for hosting Cheryl – have a great weekend! Wow, looks absolutely delicious!! PINNING! Happy Birthday to you! Your cake looks fantastic … I can’t believe that I’ve never had an icebox cake … I must make one soon. You can never go wrong with ice box anything! thanks for the share! can’t wait to try it out myself. I’m sure the whole family will enjoy it. Wow, Cheryl. That cake is IMPRESSIVE! And I love that it’s so easy. I need to make some low carb chocolate wafers and try this myself. 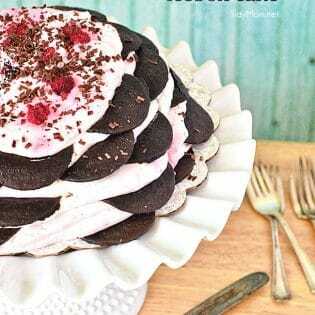 I love the way icebox cakes look, especially this one! And the recipe looks killer. Yum! Wow I always thought that icebox cakes would fall apart when you sliced them but look at that perfect slice you got! I’m just now catching my breath and getting to me Reader 🙂 But I’ve been wanting to tell you that I adore this cake! 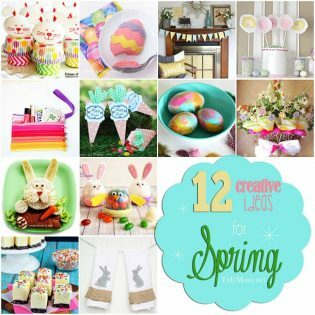 We featured your cake over on #livingcreative Thursday at Living Locurto. IT LOOKS AMAZING!! Thanks!